On the heels of a legislative session that saw proposals to strip away active consumer consent to alternative parts, aftermarket parts proponents last week expressed opposition to the idea of going beyond passive disclosure of what kind of components were used in a collision repair. 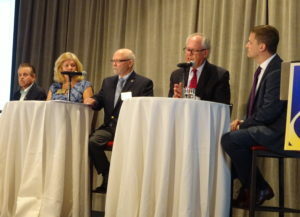 Alliance of Automobile Manufacturers senior director of state government affairs Wayne Weikel said during a July 25 Collision Industry Conference panel that his organization supported informing a consumer when an insurer was paying the bill. A consumer paying out-of-pocket could make their own choices. Carriers typically are the ones pushing for aftermarket parts to save themselves and potentially — but not necessarily — save their policyholders money. (Premiums would be about $19 higher without imitation parts, the PCIAA has estimated.) In theory, the policyholder’s more passive role in an insurer-pay repair, compared to what’s likely a more active decision-making role in a self-pay repair, could leave them unaware of what’s being used to fix their car. Insurers argue that by signing a policy allowing the carrier to put like, kind and quality imitation parts on the car, the consumer understood what would happen and was providing consent, according to Weikel. But he said “we don’t think insurers do a very good job of explaining” what’s in those policies, and it was important a consumer be actively involved in selecting what parts go on their car. “Not on our watch,” he said of consent repeal efforts. Multiple states have required a disclosure that aftermarket parts could be or are used, but there’s a chance the consumer glosses over that text without reading it, Weikel suggested. “We think disclosure’s useless,” he said. “Absolutely, disclosure is important,” LKQ Corporate Accounts Vice President Terry Fortner said. But he said written consent just helped car companies get a monopoly on parts sales and he opposed asking a customer to approve the parts used on their vehicle. Fortner said LKQ had talked to a lot of consumers, and “they are absolutely comfortable” with disclosure alone. “There’s a fundamental problem with consent: Why do you need to consent to something that is the same?” Certified Aftermarket Parts Association Executive Director Jack Gillis said. However, Gillis himself had during the panel discussed how many aftermarket parts don’t meet CAPA’s standards, and Silver recalled getting sent an unworkable, uncertified Keystone part. “The material was completely different. The fit was nonexistent. It was just a really, really bad part,” said Silver, a CAPA proponent who noted that more insurers seem to be writing for uncertified parts these days. If aftermarket parts are as good as or better than OEM parts, the way proponents claim, why would securing consumer approval be a problem, Weikel said. “Either you’re willing to stand behind these parts, or you’re not,” he said. He called consent “a really tricky issue” for consumers and consumer groups.